The personal property tax in Michigan is a tax on the equipment and machines that businesses use. First, let's get a little griping out of the way. There are many problems with this language. It doesn't mention the central issue the Legislature is trying to address: the phase out of the "personal property tax" on businesses. The language appears to show bias toward a "yes" vote - "modernize the tax system to help small businesses grow and create jobs in Michigan." It contains an inaccuracy - the state's use tax isn't capped at 6% by the constitution. The state sales tax is. Craig Thiehl of the Citizens Research Council lays out how this confusing and inaccurate language made its way to the ballot in his post, "Huh? Why am I Voting to Modernize the Tax System?" The legislators used their words, just not words you or I understand. Now that we got the griping out of the way, what is this proposal all about? You're being asked to vote on a measure that represents a big change in how local governments collect revenue across the state, and in how the state shares revenue with local governments. A "yes" vote would endorse the Legislature's plan to phase out the personal property tax in Michigan. A "no" vote would essentially nullify the Legislature's plans, and keep the personal property tax in place. What is "personal property tax"? Local governments in Michigan rely on the taxes they collect to run their cities and communities. Property taxes pay for roads, police and fire, support schools, etc. In Michigan, local governments not only collect those typical property taxes – the taxes you might pay on a house, for example – they also collect something called a "personal property tax." That's a tax businesses pay on all kinds of equipment they might own. 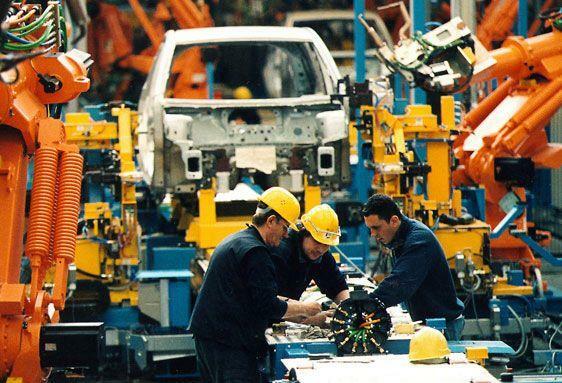 It could be heavy machinery for a carmaker, or a dishwasher in a restaurant. They say it's a burdensome, confusing tax and it kills investment. They're trying to get the tax repealed. But when lawmakers first tried to pass the phase-out, they received all kinds of opposition from local governments. Municipal leaders said taking this tax away from them would hurt the health and well-being of their communities. And for some of communities, in areas with a lot of manufacturing, personal property taxes make up a great deal of their revenue. 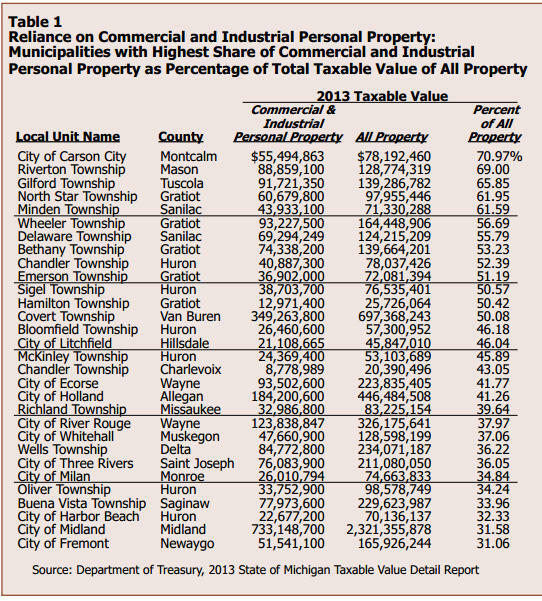 Some of the Michigan communities that rely heavily on personal property tax. In its analysis of Proposal 1, the Citizens Research Council shows which communities in Michigan rely heavily on the tax. To alleviate this burden that would be placed on local governments, the Legislature agreed to offset the costs by diverting some of the state's use tax back to local communities. The state's "use tax" is not the same as the sales tax. A use tax is taxes paid on all taxable items brought into the state, and on certain services like telecommunications and hotels. The process for shifting use tax money to local governments is complex. For starters, it establishes a "local" (yet statewide) board that would be responsible for doling out portions of the state's use tax to local governments. 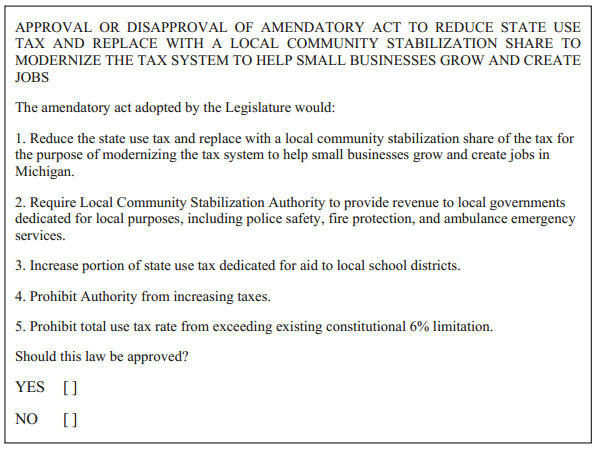 The "Local Community Stabilization Authority" would direct the use tax money back to the local governments based on a formula. "I am confident that this change will both update our tax structure and ensure that our communities have a stable stream of revenue into the future, all without raising taxes on our working families." There are a lot of supporters of this ballot proposal. You can see a list of them here. But Warren Mayor James Fouts says he's not one of them. His city, home to large GM facilities, relies heavily on the personal property tax. It has been our experience that businesses choose to locate and invest in communities for a variety of reasons, only one of which is low taxes. Qualified workers, excellent transportation, reliable infrastructure, dependable public services, quality schools and desirable neighborhoods are all important ingredients. I view Proposal 1 on the August ballot as another large corporate giveaway that will result in service cutbacks and employee lay-offs by cities like Warren. Because a chunk of the state's use tax revenue will be diverted to local communities to offset their losses, it will mean that there will less money available for other things the use tax currently pays for. 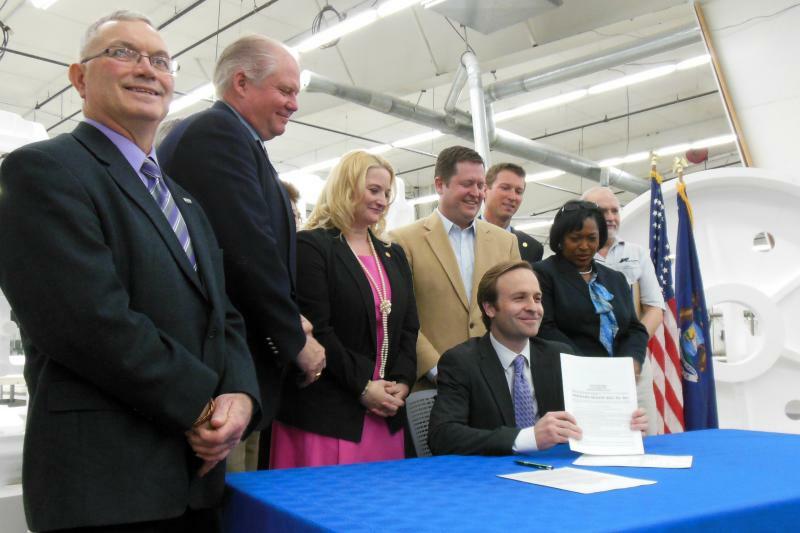 … the legislation would represent a major shift of current revenue from state budgets to local units of government in order to provide the reduction in personal property taxes for manufacturers, small businesses, and other commercial enterprises. In other words, the use of this money for local unit reimbursement means it is not available for other purposes. Other major uses of General Fund revenue currently include the state’s Medicaid and other health care programs, Corrections spending, operational support for public universities and community colleges, human service programs, the Michigan State Police, and transportation spending. With new taxes and expiring credits on businesses, the agency estimates the losses at $75 million to $125 million a year through fiscal year 2024/25. So, as the House Fiscal Agency's analysis notes, the question before voters is whether this is a worthwhile way to spend the state's revenue. If voters reject the proposal, the CRC notes that it essentially cancels the whole set of reforms and re-establishes the personal property tax. Michigan voters will have a chance to drive the final nail into the coffin of the state’s Personal Property tax this summer. The Board of State Canvassers today designated the PPT question as Proposal 1 on the August 5 ballot. It will be the only statewide question on the ballot. Businesses pay the tax based on the value of their equipment and other assets. Many Michigan communities rely on the tax revenues to pay for basic city services. The upcoming August primary ballot will feature something not usually seen on August primary ballots: a statewide ballot proposal, something we haven't seen in August since 2002. 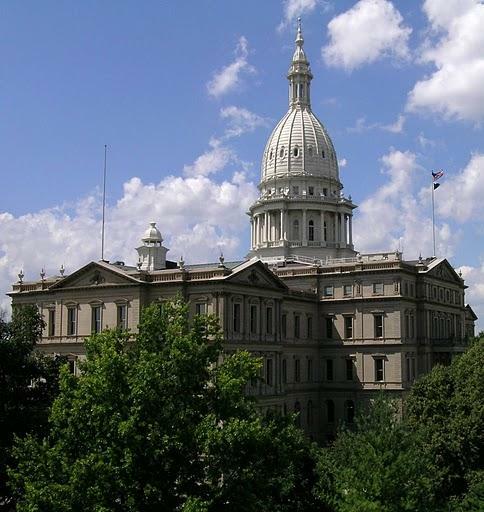 This ballot proposal will ask you to decide the fate of a reform of Michigan's industrial personal property tax, but there is a pretty significant hurdle that backers have to face: that icky little three-letter word – tax. Chris Gautz, reporter for Crain's Detroit Business, joined us to talk about all this. Voters will decide in August if businesses should get out of paying taxes on equipment each year. Michigan’s personal property tax applies to all kinds of things: Carmakers pay the tax on heavy machinery, restaurants pay it on ovens and dishwashers. It doesn't matter if the equipment is new or old. The tax amounts to several hundred million dollars each year. The effort to repeal the personal property tax was bi-partisan. A previous version replaced only a portion of the lost revenue to local governments. LANSING, Mich. (AP) - Michigan Governor Rick Snyder has signed legislation designed to ensure local government budgets aren't hurt if manufacturers and small businesses get planned tax cuts. A phase-out of taxes on industrial machinery starts in 2016 and is underway for small businesses with equipment. The tax cuts will be halted if a statewide vote fails in August. An interview with Kathleen Gray and Jonathan Oosting. When Governor Snyder pushed through a repeal of the the personal property tax — aka the PPT — in late 2012, it was seen as a good step towards encouraging businesses to set up and expand in Michigan. But local governments took it right on the chin. As the PPT phased out, many were in line to lose a significant source of revenue. But there's good news for municipal officials worried about a great big hole in their budgets. A package of bills has been introduced in the State Senate that would plug that hole, without having to revert to anything like the PPT, which Governor Snyder called "the second-dumbest tax" in Michigan. And this package seems to have just about everyone on board, including both Democratic and Republican lawmakers. Here to tell us more is Kathleen Gray from the Detroit Free Press, and MLive’s Jonathan Oosting.